With Spot it! Jr. Animals, young ones are on the lookout for creatures of the land, sky, and sea. Each card is decorated with 6 different animals of varying sizes. Here's the amazing part: there is one, and only one, matching animal between any 2 cards. Spot it and you're on the path to victory. Mix it up as there are 5 different games in 1. In each mini game you try to either gain all the cards or get rid of all of yours. 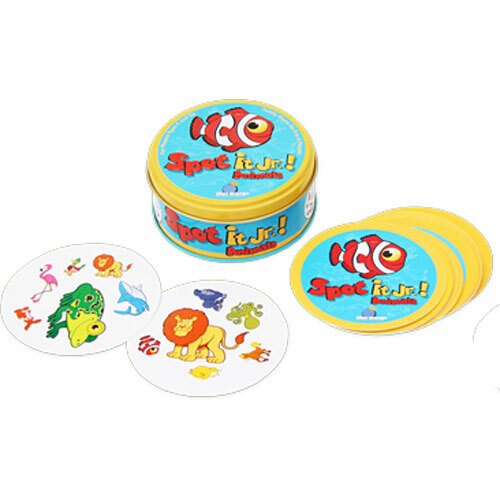 The adorable and colorful animals appeal to children, and the attractive round tin travels easily in a car, a backpack, or even a pocket. Spot it! Jr. Animals provides stimulating entertainment for any child or adult. 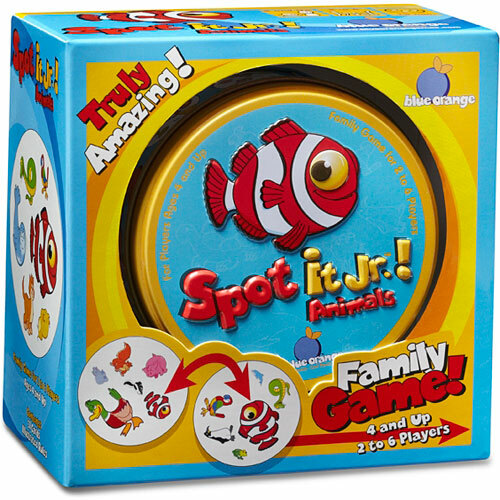 It is a smart and fun game that can be played competitively or not, and is adaptable to all ages. 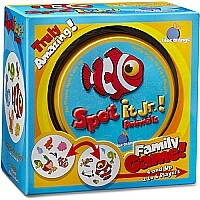 With colorful animals and brilliant game mechanics, it will quickly become your family's favorite!